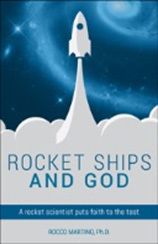 The following are excerpts from two recently-released books published by Sophia Institute Press: Rocket Ships and God, by Rocco Martino, Ph.D., and For God and Country, by Father Michael Cerrone. Thanks to Sophia Institute Press for permitting me to publish these excerpts in my column. Click here to order the books directly from the publisher. Dialectics is a method of argument that has been central in both Eastern and Western philosophy since ancient times. While it might be claimed to have originated with Socrates and extended by Plato in the Socratic dialogues, dialectics is rooted in the ordinary practice between two or more people who have different ideas and wish to persuade each other. This was essentially the method used throughout history in Hebrew schools examining the teachings in the twenty-four books of the Tanakh (an acronym in Hebrew for teaching, prophets, and writings), which Christians describe as the Old Testament. The minimal foundation of any dialectical exchange is that the participants, even if they do not agree, must share at least some meanings and principles of inference. In addition to the Socratic, Hebraic, and Thomistic forms of dialectic reasoning, you'll find an analogous commentary and response approach almost anywhere you turn, from the Hindu and Chinese philosophical traditions, to modern quasi-prophetic treatments of the writings of Georg Wilhelm Friedrich Hegel and Karl Marx. Briefly stated, two or more people orally debate a premise; or perhaps one person lists and addresses various possible objections to the premise himself – as St. Thomas did – and then applies reason to demolish the objections, leading to verification of the initial premise. We can use dialectics to embark on an adventure: to turn to the supernatural as an adjunct to the truths developed from our cerebral examinations of history, of the world as we have seen it, of facts related to us by others (especially as related in manuscripts and books), and verbal lore, including legends. We establish to our own satisfaction and comfort what is true, what we believe is true, and what we hope is true. This is the halfway realm of believers, agnostics, and atheists. In my own youth, I questioned a great deal. I found no answers and got little comfort for my questioning. I never quite made it to atheism, but during a certain period, I was only a few steps short of that. What is startling to me in hindsight is that I never felt abandoned by God. Rather, I was troubled because I drew no comfort from my search through ideas I had been taught from birth to accept. Still, I was fortunate. I did not suffer the spiritual depression of the kind we read about in the writings of Mother Teresa, St. John of the Cross, or Teresa of Ávila. This terrible sense of loss – this untold darkness – this loneliness, this continual longing for God – which gives me that pain deep down in my heart – Darkness is such that I really do not see – neither with my mind nor with my reason – the place of God in my soul is blank.... just hear my heart cry out – 'My God' and nothing else comes – The torture and pain I can't explain. This "dark night of the soul," to use a phrase from the mystic St. John of the Cross, did not hinder Mother Teresa from her unity with Christ or from bringing the solace and comfort of Christ to the dying. Likewise, St. Francis of Assisi, St. Paul, and even St. Peter prevailed even though they doubted and questioned at times. The writings of many mystics throughout history attest to the fact that they found truth and were satisfied that the truth would sustain them. Although comfort was their goal, they persisted even when their comfort was incomplete. Spiritually, they had traveled a good distance up the curve toward perfection even while, psychologically, they were at a point at which they felt abandoned. Rather than despair, they took this as a spur to work harder, to seek harder, and to become closer to God. So let it be with us. There need not be a magic bell that rings when we hit goodness or truth. It is a lifelong quest to find truth, to accept it, and to follow it. In 1990, Father Gerald O'Collins, S.J., in the Jesuit magazine America, wrote of three theologies: the theology of the mind, the theology of the heart, and the theology of the spirit. He likened the theology of the mind to the cerebral approach taken in the United States, in Canada, and in Europe. Through this theology, through faith and reason, proofs for the existence of God and proofs for truth were revealed or determined. The theology of the spirit is characteristic of the East, where awe, reverence, and holy fear prevail as man regards the power and majesty of God the all-knowing and all-powerful One who regulates all things. In this theology, the spirit speaks and eliminates doubt through faith and the stirring of the spirit. I well remember the first time I attended Mass in the Eastern rite. It was at the Russicum, the Church of the Russian Catholic Church beside the Orientale, the part of the Gregorian University in Rome dedicated to the study of Eastern rites. I wondered why the Consecration was behind a screen, hidden from the faithful. I thought it strange until I learned that it was part of the mystery of the Consecration. The incense was heavy, leading to a certain heady feeling, intensifying a great sense of mystery and awe. The reverence of the faithful was in striking contrast to the almost casual demeanor we see in the pews in the United States and in Canada. The theology of the heart is paramount in Central and South America, where Jesus mystically is felt laboring side by side with His people. The heart leads the way to truth, to acceptance, and to dedication. I have watched pilgrims at the shrine at Guadalupe in Mexico City walk for miles on their knees, bleeding and torn. I marveled at their faith, appreciated it, but knew that in my cerebral conditioning I could never follow this path. I wished I could. What happened for me is that, as a young man, Jesus was my buddy and my friend. As I grew, He grew and became the Jesus of the Passion and the Jesus of the Resurrection. However, as I aged, the Holy Spirit came to be a greater and greater factor in my life. I have often felt the presence of the Holy Spirit, even though I think of God the Father in the same terms as I think of my own father. For me, the Trinity is real. There was a time, however, in my early twenties when, like Mother Teresa, I felt bereft of the presence of God and came to doubt. 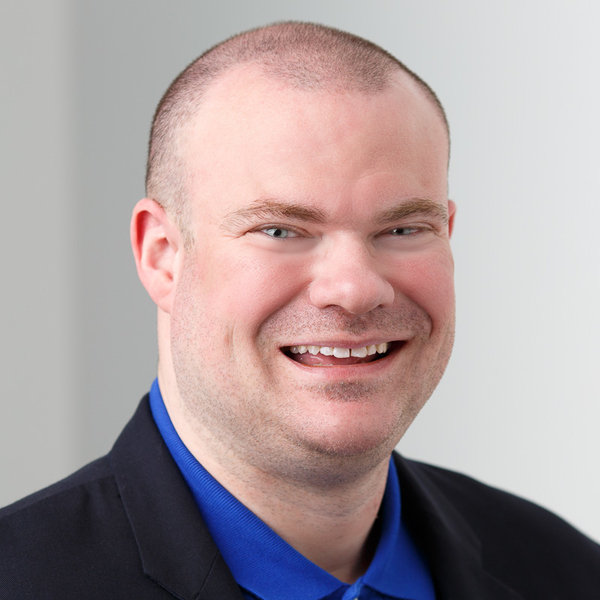 My cerebral approach left gaping holes and questions with no answers. But at least my cerebral approach was directed in the hope of finding truth. My faith was challenged, crippled a bit, but never totally lost. I believed, but ... Was there really a God? Was there an afterlife? Do we have souls? Was Christ both God and man? How? Why? How could I tell? I read extensively – in a hurry, blessed by the fact that I had learned at a younger age to read rapidly. I learned that I was far from unique. My concerns and questions had been shared by many throughout history. In the Chapel of the Most Holy Trinity at West Point, New York, the stained-glass windows along the side walls depict various patron saints of soldiers, among them Michael the Archangel, prince of the heavenly army of angels; George (Asia Minor) and Maurice (Africa), soldiers and martyrs of the early Christian era; the veteran soldiers Martin of Tours (France) and Ignatius of Loyola (Spain); and very prominently next to the archangel, Joan of Arc, the Maid of Lorraine (France) and soldier-martyr for God and country. I first noticed that particular window of the lone female soldier-saint during my freshman year of college as a seventeen-year-old cadet at the United States military academy. It did not occur to me then that Joan was the same age when, after being called by God, she was appointed by her future king to be the soldier-leader of a small army loyal to France and rallied a demoralized people to initiate the liberation of their homeland. Nor did I know in 1964 that the Catholic Church had declared her to be a saint of God only in 1920, nearly five hundred years after her death at nineteen years of age by burning at the stake in Rouen, France, on May 30, 1431. Many more years of my life passed before I realized the full significance of her extraordinary, heroic witness, not only for the nation of France but also for other nations whose citizens profess a love for the one true God and for their home countries. After more than five years of U.S. Army service as an infantry and military intelligence officer in the Vietnam War and the Cold War, a year of music and international relations studies, and then six years of seminary and parish work, I was ordained a priest in 1981. Returning in 1990 to army service in the chaplain corps, whose motto is Pro Deo et patria ("for God and country"), I served in the Persian Gulf War of 1991 and later in other troop assignments. But it was not until a few months after the terrorist attacks of September 11, 2001, that I finally learned from a fellow Catholic chaplain that my priestly ordination day and Saint Joan of Arc's feast day are the same – the same day also as the traditional Memorial Day, on which we honor all war dead of the United States of America. Joan's spirit of religious devotion and patriotic duty began to exert a strong influence on me. In the Lord God's great plan, historical coincidences are really providential times of grace for us. My priesthood, which began exactly 550 years from the day of Joan's death, is now a constant reminder for me to imitate Jeanne La Pucelle (Joan the Maiden) by leading souls in religious fidelity to God and compassionate charity to others. Twenty years of active military service, the last fifteen as a chaplain, made me appreciate more fully the virtue of patriotism, the love of one's country, which Joan embodied by selfless service to her king and her people, at the cost of her own life. Memorial Day too has its special poignancy for me in honoring "the last full measure of devotion" rendered by my friends and classmates killed in Vietnam during the war against atheistic communism, and by many others who sacrificed themselves in past battles against all enemies, both foreign and domestic. Those quoted words of Abraham Lincoln, first addressed as a tribute to the thousands of fallen soldiers after the bloody battle at Gettysburg during the American Civil War, apply equally to all who have died fighting their nations' wars against tyranny and oppression. Memorial Day remembrances now also honor the last full measure of devotion by those killed in the present-day global war on terrorism. These complementary virtues of religion and patriotism are increasingly evident in many of today's military men and women, who serve as guardians of peace, defenders of life, and enforcers of justice, at home and abroad. With Joan of Arc, they extend the divine legacy of noble, godly souls who demonstrate single-minded devotion to a just or holy cause. Yet not only military personnel but all citizens need these virtues, particularly during times of cultural clashes and religious wars, raging even in this new millennium of Christianity. Every person of every nation in every epoch of world history can imitate the timeless model of heroic virtue that Joan of Arc reveals – a beautiful reflection of Jesus Christ. 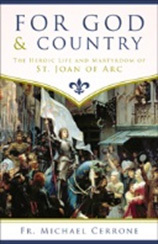 In the last two years of her life, as a combat soldier and a prisoner of war, Joan the Maiden encountered opposition to her mission; a demoralized army; divided loyalties among the clergy, nobility, and commoners in the towns and districts of her occupied homeland; and during her trial, the treachery of churchmen in league with the enemy. Nevertheless, she remained faithful and true to Almighty God in the Church's sacramental life and to the heavenly Voices in her own prayer life. She vigorously protected her virginity and promoted piety and good morals, especially chastity, among her troops. And she was courageous, disciplined, and bold in leading battlefield operations, despite injury to herself and danger of death. Perhaps most unusual for a leader in warfare, La Pucelle personally and compassionately tended many combat casualties, not only her own French soldiers but English troops as well. She wept over the loss of human life, so grieved was she in the depths of her pure heart and gentle soul. She was especially concerned over any soldier who died in battle without a prior good confession of his sins. And in her final and most Christlike act of mercy before being burned to death, she forgave her enemies and even asked forgiveness of anyone she may have offended in her lifetime. Catholic Faith and fundamental moral principles always guided Joan of Arc in her quest for justice and peace in the social order. She clearly understood the divine purpose of her human life; and with indefatigable resolve she accomplished her mission on behalf of her country. With God's amazing grace in her soul, and even after her death, she inspired the king and people of France to fulfill their own mission of restoring themselves as one nation under God. This literary offering is not an attempt at scholarship about Joan's life. Rather it is my humble meditation on her legacy of virtue, always victorious over vice. Saint Joan of Arc, in her heroic and enduring love for God and country, continues to inspire those who come to know her. Almighty God continues to grace and bless those who follow her noble example of virtue, as she followed Christ in doing the Father's will. May God help us fulfill our own social, religious, and civic duties. Let us work together for reconciliation with God and neighbor, unity within Christ's Church, justice and respect for every human being, and peace among all nations on earth.